Legal Department was established in September 2004 as Legal and Disciplinary Bureau (Unit Undang-Undang dan Tatatertib, or UTT) under the Registrar Department. At that time, UTT was manned by a single Assistant Registrar, backed by one support staff. Then, in September 2009, UTT was upgraded to Legal Division (Bahagian Undang-Undang, or BUU), with five staffs comprising one Senior Assistant Registrar, one Assistant Registrar, one Assistant Admin Officer and two Administrative Assistants. On 1 January 2014, the Registrar Department was restructured and BUU was upgraded to a university PTJ. This structural reorganization was executed upon the approval of the University Board of Directors (Lembaga Pengarah Universiti, or LPU) in an LPU meeting no 4/2013. The new PTJ is known as the Legal Department (JUU) and it was placed in the Chancellory Department under direct supervision of the Vice Chancellor. JUU was located at Level 1 of the Chancellory Building, USIM with the capacity of six staffs including myself as the Legal Advisor, supported by two Legal Officers, one Office Secretary and two Administrative Assistances. According to Pn Yuhani Jamiran who is leading the Legal Department (Jabatan Undang-undang, or JUU) establishing the Legal Office is unique and has its own challenges. The main role of JUU is to provide legal counsel as well as to ensure smooth operations based on client pledge to all university members. 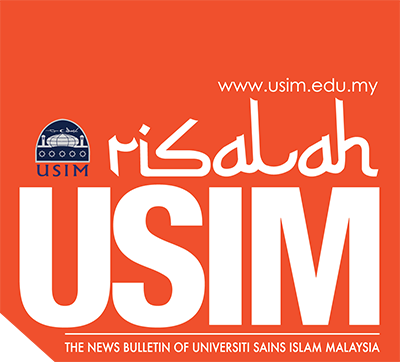 I began serving USIM on 23 August 2013 as a Legal Officer. I was appointed as USIM’s Legal Advisor after more than 18 years of practising law as an advocate and solicitor in several law firms around Klang Valley. S2 Can you explain the objectives of establishing a Legal Office in USIM? The objective of JUU is to provide quality legal services according to the University Constitution and Law. It is aligned with JUU’s mission to ensure that university matters relating to legal is governed fairly, effectively and efficiently. The role of JUU is important and significant to ensure that all the university’s agenda meet the law requirement and that the interest of the university is protected. This is because JUU serves as the reference point for all law matters including academic, university administration and operations, staffs and students, as well as asset management and university development. S3 How do you see the role of JUU in supporting the University to improve transparency in good governance best practices? Good governance is “a normative concept of values towards realizing governance behaviour and methodology used by a group of social actors interacting according to certain social context”. There are two major aspects that needs to be stressed upon in good governance in an organization. The first is effective and efficient service delivery, and secondly, legal compliance. S4 What activities does JUU organize to create awareness among university members on the importance of the legal aspect? Since JUU was established, various activities have been organized to provide clearer understanding to the university members on the importance of the legal aspect by referring to the University Constitution, University and University College Act 1971 (AUKU), as well as other relevant laws. The programs include Disciplinary Briefing for Staffs and Guideline to Manage Issues with Officers, Briefing on Investigation Procedure and Report Submission for Misconduct of Staffs and Students of USIM, Briefing on Basic Contract Management: GST Implementation and its Impact on the Legal Aspect for USIM, Data Privacy Protection Seminar: Policy and Implementation at the University, as well as Seminar on Social Media in IPT: Implication in the Legal Aspect. JUU had also organized public awareness talks which were open to all USIM staffs and students, for instance The Role of Land Office in Managing Small Inheritance. As a PTJ, JUU also strives to fulfil its social responsibility involving charitable giving and voluntary service to the public and local community. On 23 August 2014 and 13 September 2014, JUU had organised charity programs at Rumah Jagaan dan Rawatan Orang Tua Al-Ikhlas, Puchong together with USIM staffs as well as the Faculty of Medicine and Health Sciences of USIM. On 30 June 2016, JUU had collaborated with Corporate Planning and Quality Management Centre (PPKPK) USIM to organize a Charity and Iftar Program with the less fortunate groups of people around Nilai. JUU is also honoured to be a reference point for local colleges/universities as well as abroad, with courtesy visits by the Office of Students Affair and Alumni of Kolej Universiti Islam Melaka (KUIM) on 9 March 2016 as well as by the Legal Officer of the University of Kuwait in an attachment program from 3 to 6 November 2014. S5 What are the challenges that you face when managing the Legal Office in USIM? There are various challenges that I have faced in managing JUU all these years. As the Head of Department for a PTJ that is relatively new in USIM, all JUU staffs, including me, are responsible to uphold the department to a high status so that it could be a respectable, authoritative, dynamic, efficient, and act as a source of reference for the USIM community. Other challenges include our efforts to inculcate awareness and understanding to all the university staffs and students on the university legal system, towards achieving a Blissful Campus (Kampus Barakah) inspiration, on top of correcting or revising practices which do not meet legal requirements. Other than that, with a wide scope of roles that JUU has to cover encompassing all aspects of university administration with limited number of existing staffs, it can be quite challenging for me and all JUU staffs to ensure that all tasks entrusted to us can be implemented perfectly and smoothly. S6 What is your hope and message for the university members with regards to upholding a sustainable good governance and law in USIM? I have always believed that the ability for an organization to progress forward depends on the commitment of their staffs to follow designated rules. Laws are drafted and enforced so that they can be guidelines to all staffs and students to ensure all behaviour and actions are within the legal parameter set to guarantee harmony in the university. I pray to Allah may USIM be successful in its intention and mission to become a global centre of reference in the integration of Naqli and Aqli knowledge with full support from its staffs. May USIM campus become a Blissful Campus which would always be a peaceful and blessed environment to its members as well as to the public in general.